All you would need to do is to keep an eye on the pivot point. You could treat it like the 50-yard line of a football field. Depending on which side the ball (in this case, price) is on, you can tell whether buyers or sellers have the upper hand. 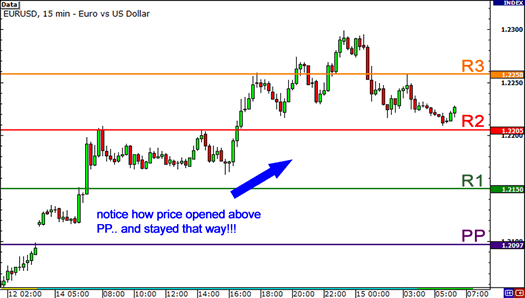 In this example, we see that EUR/USD gapped up and opened above the pivot point. The price then rose higher and higher, breaking through all the resistance levels. 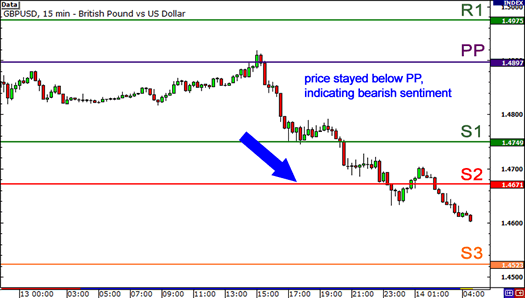 In the chart above, we see that the price tested the pivot point, which held as a resistance level. Next thing you know, the pair keeps going lower and lower. If you had taken the clue that price remained below the pivot point and sold the pair, you would have made some nice moolah. GBP/USD dropped almost 300 pips! 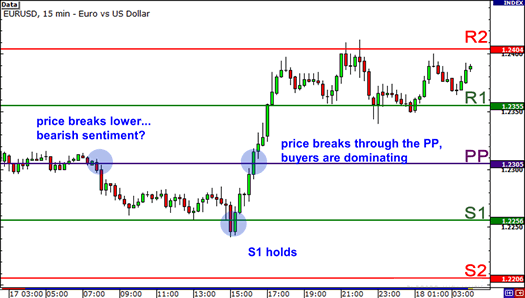 How forex traders feel about a currency can shift dramatically day to day, even session to session.